Want to power your smart phone, tablet, Raspberry Pi, or Arduino project with green solar energy? This kit includes everything you need! 251 backers pledged $31,941 to help bring this project to life. The BootstrapSolar Power Pack Kit is a portable device that allows you to use clean solar energy to run or recharge small USB powered electronic devices like smart phones, iPads, Arduino boards, EL wire, and much more. There are other commercial solar "phone chargers" out there, but they are either over-priced or under-powered to the point of being impractical. 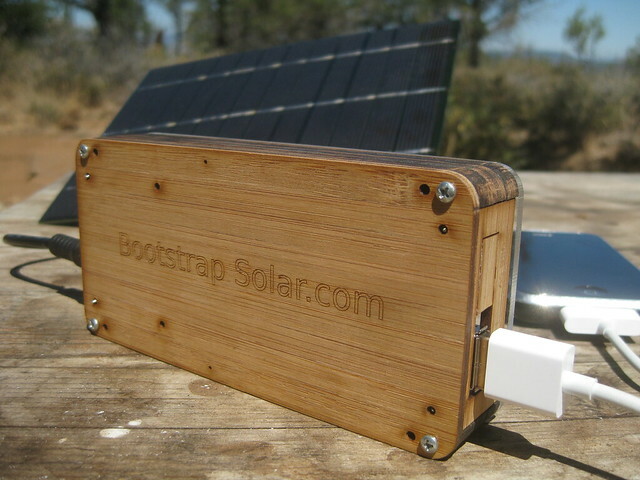 The BootstrapSolar kit is designed to be affordable, practical, open, and hackable. 6Ah/22Wh Lithium Polymer internal battery. That's enough capacity to recharge an iPhone 4-5 times, and recharge an iPad about 70%. Two USB ports with up to 1.5A output (one port configured for Apple devices, with output up to 1000mA). Charge controller circuit that can charge the internal battery in as little as 6 hours, *while* also charging an external device, all from clean solar energy! Bamboo enclosure -- more sustainable than plastic! Open Source and hackable circuits have extra pads for soldering on your own wires/connectors. More at: BootstrapSolar.com, Facebook and Flickr. It's quite simple. Once assembled, you plug the solar panel (or two) into the power pack, and place the panel(s) in the sun. This will charge the internal battery, so that you can use that power anywhere you want, even after dark. To run or charge your devices, just plug them into the USB ports, and presto, you've got power! You can get more creative too. For outdoor uses, you can strap the solar panel onto a backpack or hydration pack, or even a bicycle! Do you have an outdoor Arduino powered robot? This kit can power your Arduino board over USB, and you can use the 2nd USB port to draw up to 1A @ 5V (actually, up to 1.5A combined... and you might be able to get away with 2A). Making stuff is fun! -- If you remember how to glue stuff (you did pass kindergarten, right?) you can assemble this kit. And trust me, it'll be more fun than just buying yet another gadget. You build it, you fix it -- Any product with an internal battery will eventually become an expensive brick, because batteries can only support so many recharging cycles. With this Power Pack Kit, however, if your battery starts to lose capacity, you can simply swap out the battery, and only the battery. The same goes for all other components; if you break the enclosure, or fry a circuit, just replace what's broken. You save money, and you produce less waste. You build it, you upgrade it -- The kit is easy to assemble, which means it's also easy to disassemble and swap out components. If we come up with, say, a new version of the circuits, you'll be able to upgrade just the circuits. If new, more efficient solar panels become available in a few years, just replace the panel. Again, save money, reduce waste. Bring manufacturing home. Heck, bring it into the living room. -- Do you lament how our society seems to have lost our manufacturing mojo? Are you opposed to sweatshop labor? This is your chance to beat the trend. How can you compete with commercial products in price? If you can find a commercial solar power pack with even similar specs for a comparable price, let me know. As of date, I have yet to find a similarly priced product that can match this kit in terms of solar panel wattage, internal battery capacity, or output current. Not to mention, commercial products aren't as open and hackable as this kit, so you're paying more for a product that does less and will grow obsolete sooner. You -- Most businesses have investors who demand a cut of the profits, and therefore demand ever increasing profits. BootstrapSolar has no investors, except for supporters like you. That means we can afford to be less greedy. The World is Flat -- I can buy cheap solar panels and batteries from the same sources as the big boys. Open Source -- One of the circuits in the kit is based on an Open Source Hardware design. Using an existing design significantly reduced development costs. Free tools -- The kit was designed and developed using free tools, like Eagle CAD, SketchUp, and Inkscape. Also, by doing most of the design work myself, I was able to keep skilled labor costs down. Manufacturing 2.0 -- Traditional manufacturing was expensive and required "economy of scale" to make products like these economical. Modern technologies like CNC laser cutting & routing, 3D printing, and services targeted at the DIY/Maker crowd make prototyping and product development much cheaper. I am using Kickstarter instead of traditional investment because I believe that projects, products and companies should be funded by people who care. Generally, investors are only in it for the money -- they don't care about the product, they don't care about the employees or customers; they only care about profit. I think that is a broken model. if still more money is left (unlikely), funds will be used to develop new solar kits! Every dollar will be accounted for in a publicly visible spreadsheet. Thanks for your support! Every dollar counts towards making this project become reality. A personalized laser-cut and engraved bamboo plaque with your name on it. A Solar Hacker Edition of the kit, which has everything except the bamboo enclosure. Normally, a 5W panel and 6Ah battery alone would cost more than this, but you'll get the charge controller circuit plus booster circuit too! With 10W (2A @ 5V) of output, you'll have plenty of power to do cool stuff with! A solar power pack kit! Plus ONE of: extra 5W solar panel, spare 6Ah LiPo battery, or AC adapter. This second batch will ship after the first batch, in mid-to-late November. A Limited Edition solar power pack kit. The bamboo enclosure will have a special engraving with unique serial numbers (only 10 will be made). Additionally, the kit will come with a colored faceplate instead of the clear acrylic faceplate in the standard model. The LE kit will also come with an extra 5W solar panel, replacement battery, and AC adapter. A Limited Edition solar power pack kit, plus all the extras as described above for the $250 level. PLUS a Deluxe Edition kit (see $140 level) to give to your favorite person. PLUS, a prototype unit that will be shipped shortly after this Kickstarter campaign reaches its goal (even if it's before the end date). The prototype enclosure will be numbered, and have your name engraved on it (just in case, you know, you lose it at a bar...).